Riot watchers watching Oakland freeway riots last week watched Oakland earn the title, Demo City, USA–where an anti-property-rights-anarchist faction destroyed property and fought with cops, as America watched. Berkeley photographers, reporters, and news editors were tuned to their police scanners to be ready if Oakland style protesters, who had had their way with cops and property in Oakland…tore up Berkeley. Revived student activism. Photo by Ted Friedman. 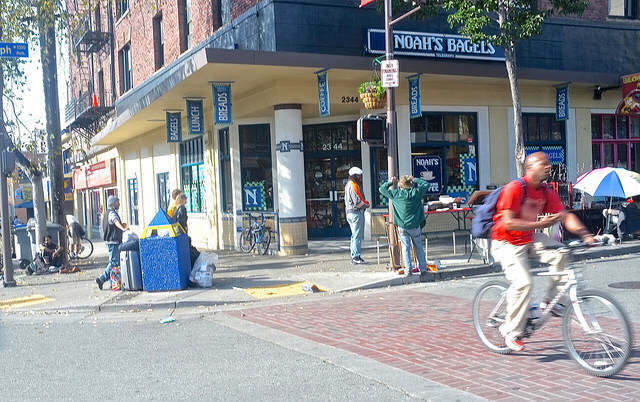 Revived student activism began more than two years ago with Occupy Cal, as UCB outdid the local Occupy, where many local protesters left for more action in Oakland. Telegraph Ave. Thanksgiving.Photo by Ted Friedman. Thanksgiving Berkeley-style basked in balmy unseasonable weather, the warmest Thanksgiving in years, according to temperature averages. Although Riots ran rampant next-door in Oakland, rioters failed to march their well-trod route up Telegraph to Berkeley. Some disappointed Berkeleyans mused that perhaps Berkeley was slipping as second Demo City in the USA, but the slippage was probably the absence of student demonstrators–who were gone for Thanksgiving. Two years ago, Berkeley Reporter reported on the latest college food oddity to hit Telegraph Avenue–Sh*t on a Stick. Only we didn’t cop-out with asterisks back then. The piece developed a cult following online, where some believed every word on the stick. Now we have another such poop-scoop, as the business on which the original story was based adopts its de-stink technology for hamburgers–sh*t on a bun. 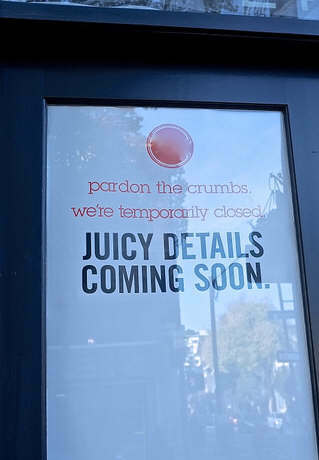 Berkeley Reporter learned today that the business on which sh*t on a stick was based is preparing to add the Sh*tty Burger ™. The sh*t burger will go for $10.95. Hate Hits the Streets protesting. Photo by Ted Friedman. As major media covers a continuing sit-in by Cal Berkeley students protesting inevitable fee hikes (the hikes have already been adopted), a small band of Peoples Park residents–protesting a recent Peoples Park ban on cardboard and tarpaulins–has won its demands, Berkeley Reporter learned Friday afternoon. 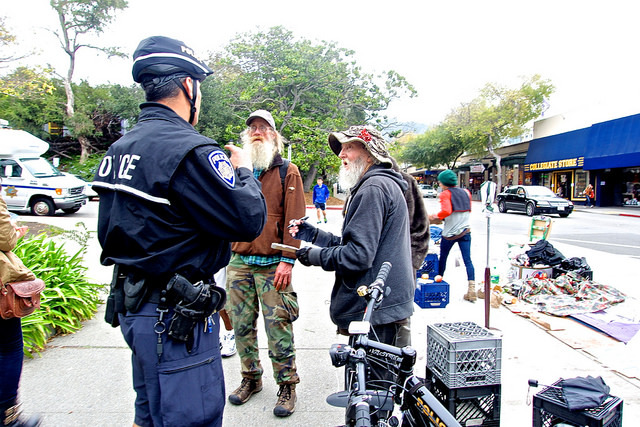 “We, were all set-up here,” said the protest organizer, Hate Man, 77, sounding almost disappointed to be breaking up his encampment on a walkway alongside University Police Headquarters in Sproul Hall. “We just got set-up here,” Hate complained. Stop Frying. Photo by Ted Friedman. Any South Side radical would tell you that student participation is the key to a successful political movement. 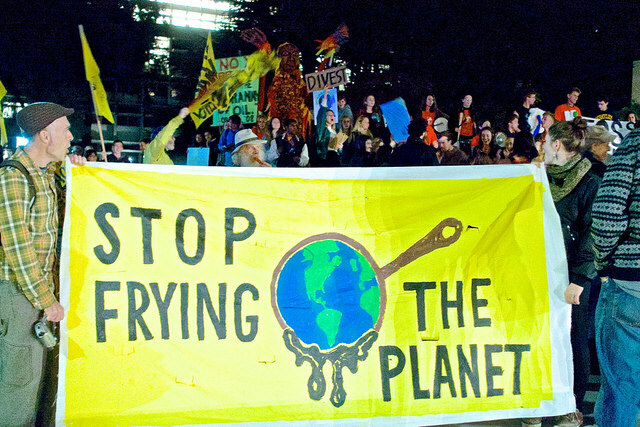 The battle for People’s Park in 1969, the Free Speech Movement, and an Anti-Apartheid movement 24 years ago that lasted six months and got UC Berkeley to divest from South Africa’s stocks. All these were student movements that got results. 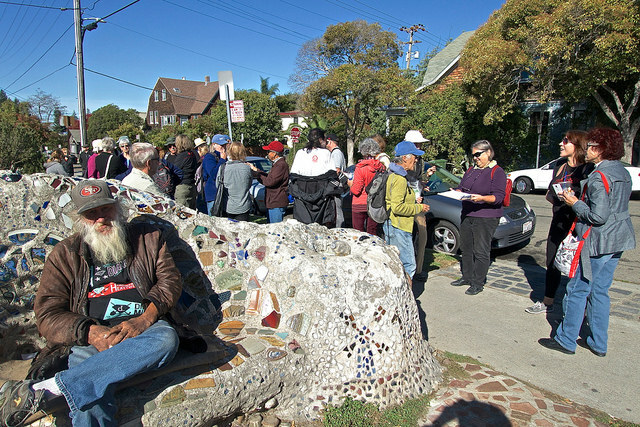 The co-leaders of what was billed as a Berkeley Path Wanderers event: “Telegraph then and now,” met at the mosaic bench beside the tennis courts at Willard Park, Sunday. Co-leaders arrived early to greet time-zone-change bunglers. Homeless man, foreground, told me he prefers Willard to Telegraph. The co-leaders said that they were both over-prepared; it was difficult to convey a sense of what Telegraph Avenue was. One of the leaders read aloud from the opening of Steinbeck’s Cannery Row, a masterpiece of detail. The tour never reached that level of detail, but it came close.